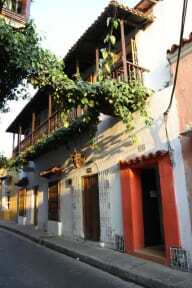 Beautiful Colonial house located in the center of the Old Town, inside the Walled City on the safest and most picturesque and colorful street. Surrounded by museums, restaurants, bars, supermarkets and more. ¡ FREE COCKTAIL PARTY EVERY FRIDAY AND WEDNESDAY NIGHT ! AND SALSA LESSONS Our bar it`s open all day long . Also we offer you free entrance to clubs every night. We had a super pleasant stay at the Hostel! 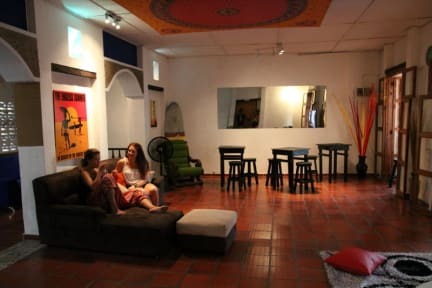 Stuff is friendly and helpful, the atmosphere is super chilled and they even offered free salsa lessons! The location is perfect so i really recommend it! Everything was clean, the staff was super friendly and always tried to help me. The kitchen was equipped good enough and clean, I couldn't compare at the laundry service as well. In the common room and in the nighttime in the dorm was a/c, not too cold. The lockers are outside the dorm, but you can always go to them and they are not broken, but most of them are small. All in all, it was a simple, but clean and nice accomodation with all you needed; I would definitely recommend it. Stuff is amazingly nice, Bar, good location and nice vibe! There are no lockers in the dorms but enough in the lobby. Unfortunately they don’t offer breakfast and guests store their food in the rooms. That attracts bugs! Good AC, friendly staff and a good equiped kitchen. No possibility to charge your phone in the dorm. The one great thing about the hostel is it’s location. Besides it’s a pretty run-down place. It’s ok overall for 1-2 nights but not really a comfy (and social) place to enjoy. Pictures are really old. Furniture is worn out. Mattresses are the worst I had in whole Colombia (broken and crooked). Owner is just there to drink and party. The only positive feedback I can give is regarding the girls at the reception. Otherwise I don't know how the hostel can get such high average points. If you don’t pay much you don’t get much! If you stay for one night, you’ll be fine. The hostel staff is super nice and you are in the middle of the old town. Good location to explore the old part of the city. But: the furniture was quite old and stinky and the dorms were really small and the beds were in a bad condition (almost falling apart). No lockers in the room. They just provide them at the front desk, but either there were broken or they were easily to crack.